Catalogue essay from forthcoming exhibition at Flinders Lane Gallery, Melbourne AUST. 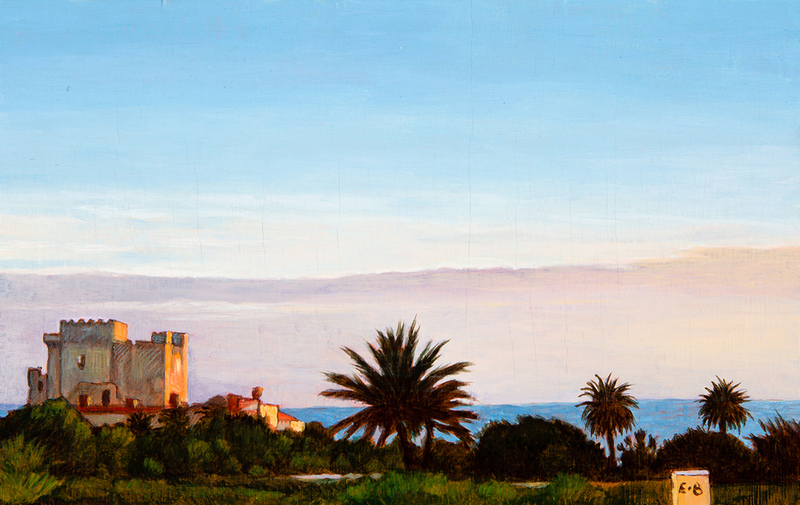 In the artist statement for this exhibition, Eolo Paul Bottaro writes “Sicily has always been present in my work, because it has been present in me.” A brief survey of his last eight solo exhibitions reveals the truth in these words. 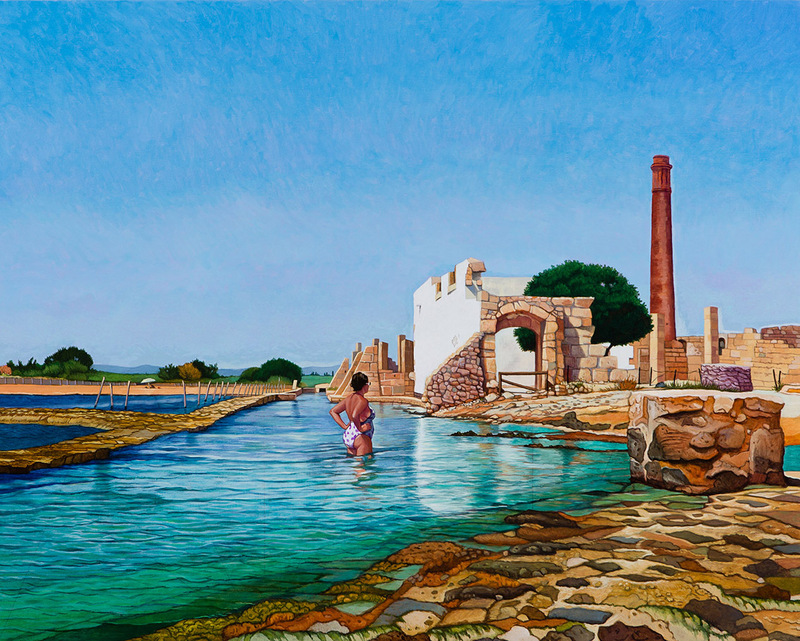 This distant land of his ancestors, girt by the cerulean waters of the Mediterranean has long fired Bottaro’s artistic imagination, and he has painted various Sicilian themes and locations intermittently over the years. From the snow-covered slopes of Mount Etna, the active volcano that regularly erupts above the city of Catania, to the dry golden hills of the economically impoverished provence of Enna. 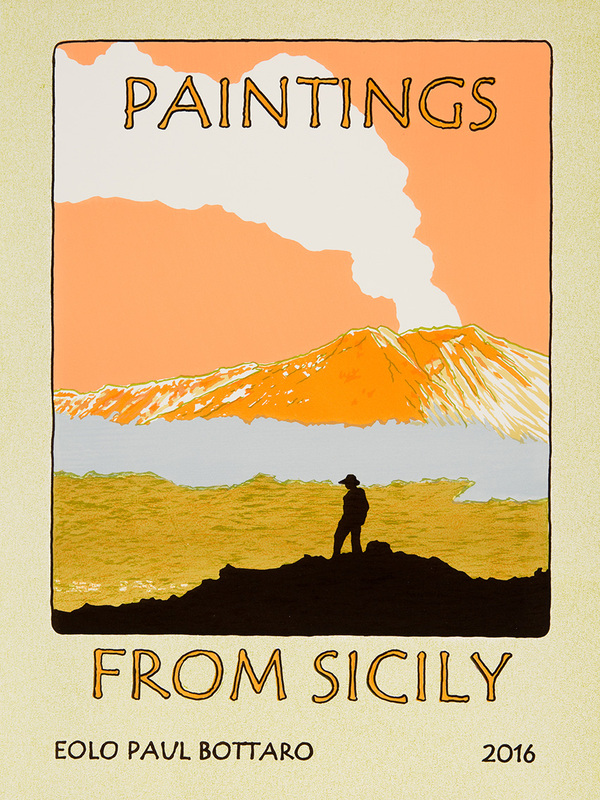 Each exhibition over the past 15 years has featured at least one major work based on Sicily. 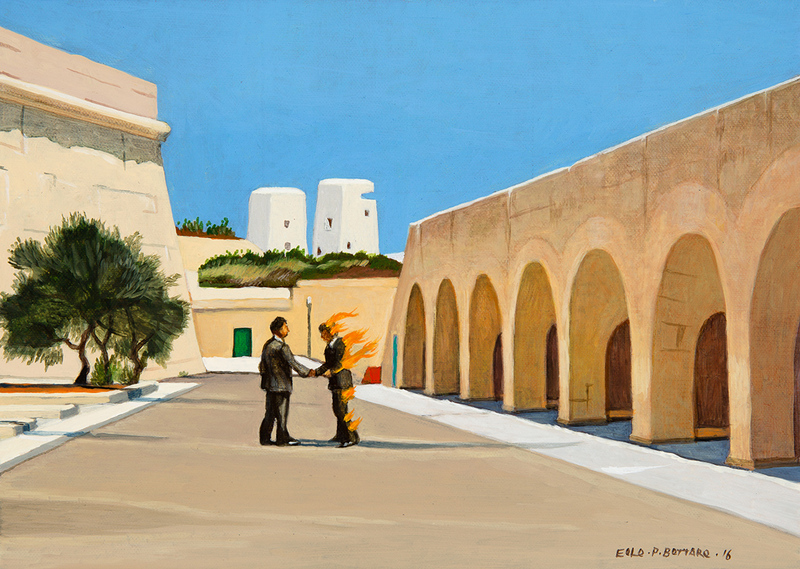 Eolo Paul Bottaro, Warm wind coming from the west – Favignana, 2016, oil and egg tempera on linen. Yet while the land of his parents birth has never been far from the mind of this Melbourne born artist, Bottaro has built his reputation in Australia through forging a distinctive oeuvre of richly coloured and beautifully composed figurative paintings, mainly of Melbourne. 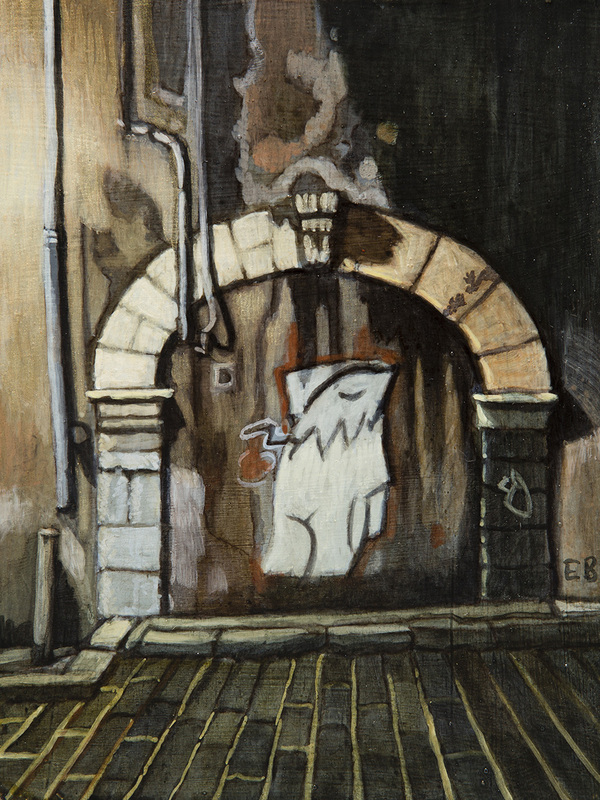 These works often feature contemporary people engaged in enigmatic, mythically inspired scenarios in an urban environment, replete with recognizable landmarks of the artist’s home city. This statement of place has always been integral to the expression of identity in Bottaro’s works, that boldly proclaim who he is and where he is from. 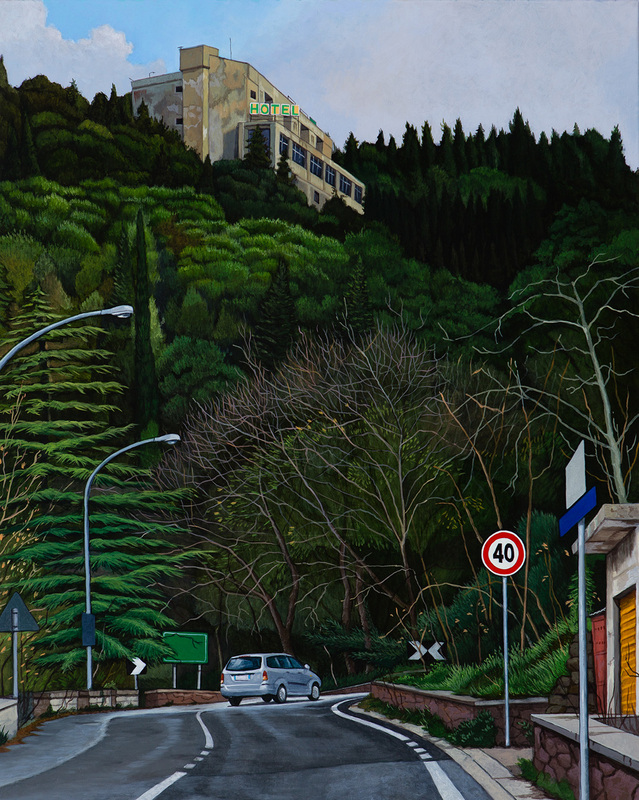 Eolo Paul Bottaro, Hotel La Pineta, Chiaramonte, 2016, egg tempera and oil on linen. In this exhibition Bottaro has devoted an entire body of work to exploring a very different place that has been partially dormant, but always present in the artist’s psyche. 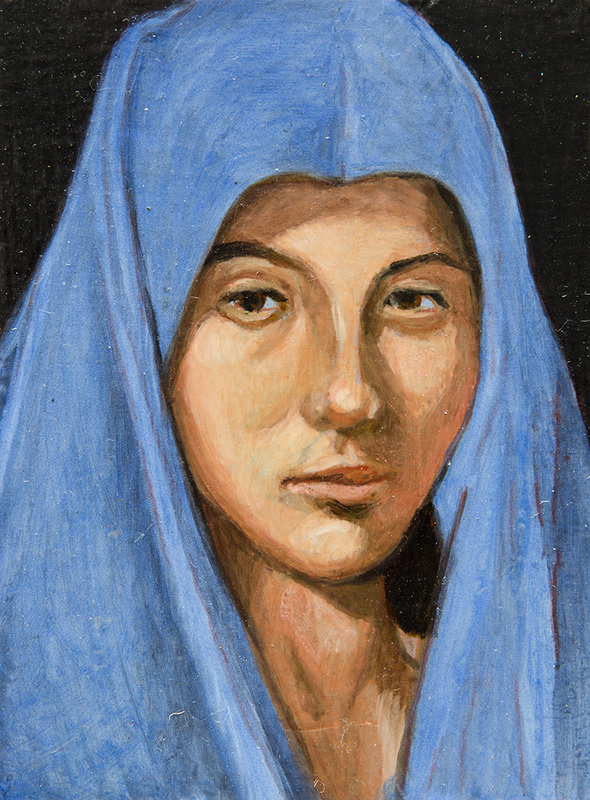 Bottaro moved to Sicily two years ago to set up his studio, and commenced travelling through the island. What he found was like an echo chamber of the various cultures that have sought to claim it through the ages. Since the 7th century BC, Phoenicians, Greeks, Romans, Byzantines, Arabs and Normans all settled or invaded Sicily, lured by its fertile lands and strategic position. These influences have shaped a particular cultural identity that while part of Italy is completely unique, expressed in its art and architecture along with the resilient character of the people. Yet vying against the glorious vestiges of history is the impact of a much uglier modernity. Evidence of the crushing corruption and poverty that led so many Sicilians to depart in the 20th century is easy to find. Abandoned construction sites abound, as do piles of rubbish left rotting on the side of the road. Once glorious historic villas and farm-houses are dotted throughout the island but are left to ruin, and there are countless stories of economic hardship, criminal activity and bureaucratic mess. Yet while acknowledging the darkness, this exhibition celebrates the natural beauty and cultural richness of Sicily that continues to endure. 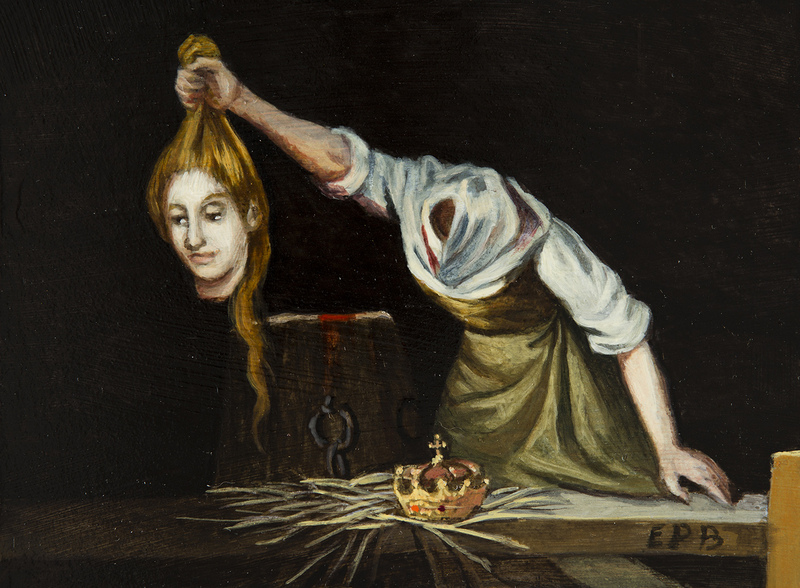 Subtle symbolic cues still exist in the works (Bottaro always enjoys posing a visual riddle for his viewers), yet he has removed much of the allegorical and mythical content prevalent in his previous paintings. What remains is an openness – a visual and psychological sense of space that allows the physical environment with its signs of ancient and modern life, to do the talking. There is much pleasure to be found in viewing these works. 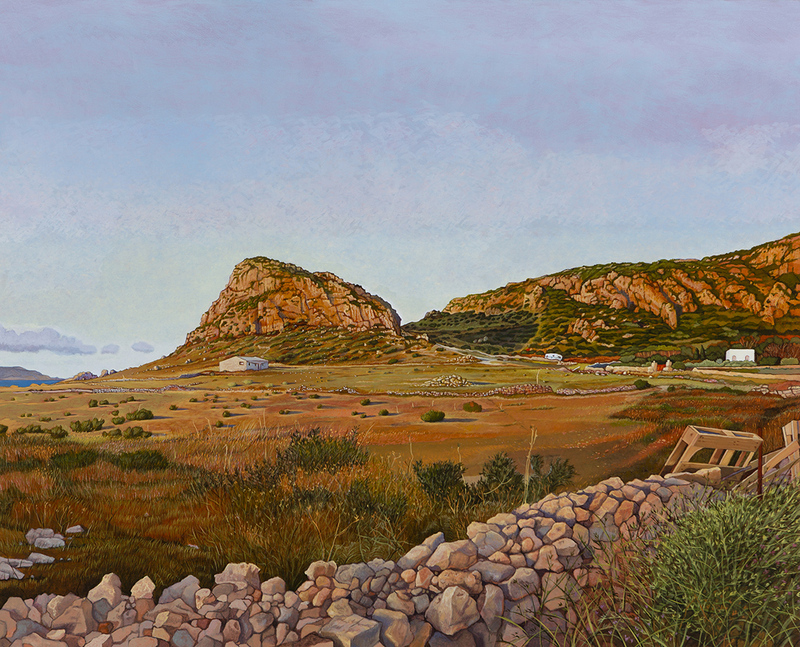 Bottaro evokes a sweeping sense of distance and space, where the eye is led through valleys and across vast planes, pausing to take in fine brush strokes that capture individual blades of grass in the foreground, or the rocks of a dry-stone wall or a crumbled ancient structure. While always consistent is the technical skill with which the paintings have been slowly crafted – one glowing glaze of translucent oil paint, after another. 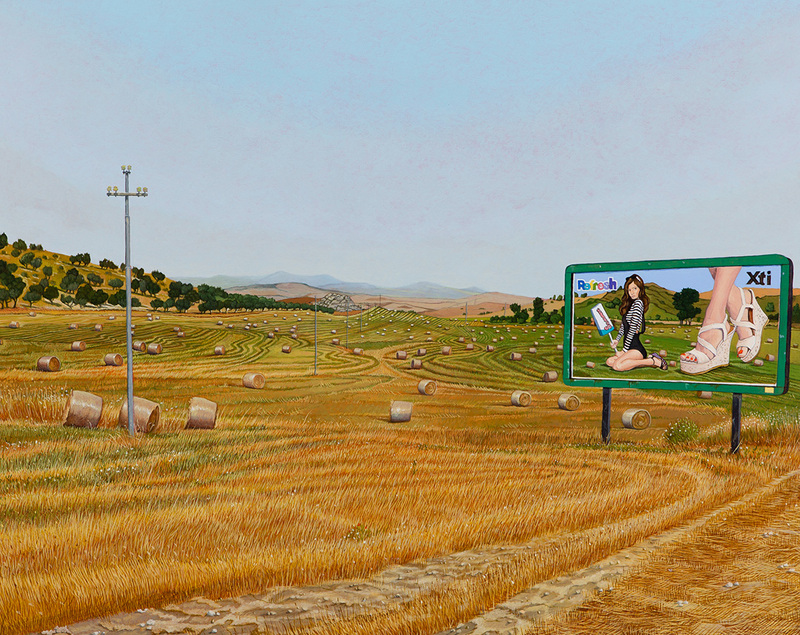 In these paintings we look upon Sicily through the un-jaded eyes of one reconnecting with a land that is rich with personal meaning. Transfixed by the spirit of the forms within this new, yet very old place, one gets the sense that for Bottaro this is the beginning of a greater journey into new terrain. Eolo Paul Bottaro, Wish you were here, 2016, oil and egg tempera on linen. Eolo Paul Bottaro, The Road to Gela, 2016, oil and egg tempera on panel. Tags: art, colour, contemporary art, eolo paul bottaro, Flinders Lane Gallery, Italy, landscape, Marguerite Brown, painting, Sicily. Bookmark the permalink.